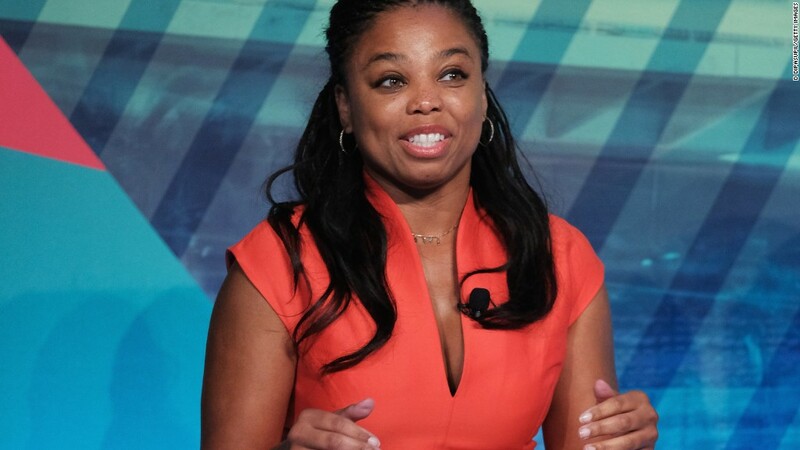 ESPN has suspended host Jemele Hill for two weeks due to "a second violation of our social media guidelines," the network announced Monday afternoon. Hill "previously acknowledged letting her colleagues and company down with an impulsive tweet," ESPN said in a statement. "In the aftermath, all employees were reminded of how individual tweets may reflect negatively on ESPN and that such actions would have consequences. Hence this decision." On Sunday, Hill took to social media to comment on Dallas Cowboys owner Jerry Jones having said that any player who "disrespects the flag" will not play referencing NFL player protests that take place during the national anthem. Hill said that "Jerry Jones also has created a problem for his players, specifically the black ones. If they don't kneel, some will see them as sellouts." She later said, "If you strongly reject what Jerry Jones said, the key is his advertisers. Don't place the burden squarely on the players." "Just so we're clear: I'm not advocating a NFL boycott," Hill tweeted. "But an unfair burden has been put on players in Dallas & Miami w/ anthem directives." Hill's co-host Michael Smith will not appear on Monday night's broadcast of their show, "SC6." Smith will be back for Tuesday's broadcast. Matt Barrie will be hosting in Smith's place, the network told CNN. Hill's suspension came down late Monday and Smith wanted to take time to "digest the situation" and it was a mutual decision between him and the network, according to a source close to the matter. President Trump commented on Jones' statement -- saying on Twitter, "A big salute to Jerry Jones, owner of the Dallas Cowboys, who will BENCH players who disrespect our Flag. 'Stand for Anthem or sit for game!'" Hill's suspension comes weeks after Hill was the center of another controversy, sparked when she called President Trump a "white supremacist" on Twitter. The White House itself eventually waded into that controversy, with Press Secretary Sarah Sanders saying during a briefing that Hill's comments about Trump were "a fireable offense by ESPN." "I think that's one of the more outrageous comments that anyone could make," Sanders said at the time in response to a question about Hill. Hill would eventually express regret for her tweets about Trump. "My comments on Twitter expressed my personal beliefs," Hill said last month. "My regret is that my comments and the public way I made them painted ESPN in an unfair light. My respect for the company and my colleagues remains unconditional." Shortly after last month's controversy, ESPN chief John Skipper sent a memo to staffers in which he said that "ESPN is about sports" and that it is "not a political organization." Bob Iger, the CEO of ESPN's parent company Disney, expressed sympathy for Hill after her "white supremacist" tweet. "I've not ever experienced prejudice, certainly not racism. It's even hard for me to understand what they're feeling about this, what it feels like to experience racism," Iger said at Vanity Fair's New Establishment summit last week. "So I felt that we need to take into account what Jemele and other people at ESPN were feeling at this time. That resulted in us not taking action on the Tweet that she put out." Hill's new tweets present a difficult problem for ESPN. While she tweeted that she's not advocating for a NFL boycott, she did write that "Change happens when advertisers are impacted. If you feel strongly about [Jerry Jones'] statement, boycott his advertisers." ESPN has a $15.2 billion deal with the league to broadcast NFL games through 2021. ESPN staffer Lindsay Czarniak took to Twitter to express support for Hill. "The suspension of my friend @jemelehill is sad and disappointing on a number of levels," Czarniak tweeted.